The staff of Kobelco Machinery Philippines with President Miyoshi Sagesaka (back row, second from the right). Mr. Sagesaka is concurrently general manager of the Rotating Machinery Plant at Kobe Steel’s Takasago Works in Takasago, Hyogo Prefecture, Japan. Kobe Steel Ltd. has opened Kobelco Machinery Philippines Inc. (KMP). 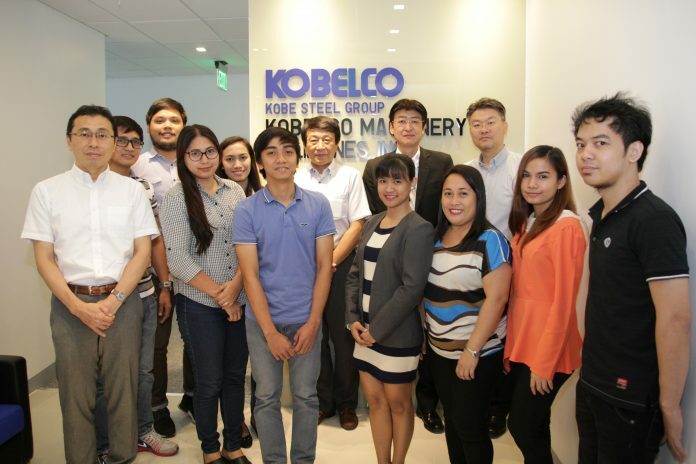 Located in Makati City, Metro Manila, Philippines, the new company provides supervisor dispatch services and engineering work for Kobe Steel’s custom-engineered compressor business in the region. With the addition of KMP, Kobe Steel now provides supervisory services from four locations around the world – Japan, China, USA, and the Philippines. In Japan, Kobe Steel has supervisors stationed at its Takasago Works in Takasago, Hyogo Prefecture. Takasago Works is the main manufacturing complex for Kobe Steel’s Machinery Business. Takasago-stationed supervisors cover Japan and provide support to overseas locations. Kobelco Compressors America Inc., specializing in skid-mounted systems from its headquarters in Corona, California, USA, provides supervisory services to North and South America. Wuxi Compressor Co. Ltd., an affiliate company, manufactures and sells a variety of nonstandard and standard compressors from its base in Wuxi, Zhejiang Province. Supervisors stationed at Wuxi Compressor Co. cover China.